A list of common military officer terms used by the United States Military and Department of Defense. Commanding Officer (OC) – An officer in command over a military unit, ship, or installation. Commissioned Officers (CO) – The commissioned ranks are the highest in the military. These officers hold presidential commissions and are confirmed at their ranks by the Senate. Holds a higher status than warrant officers and are the most common type of officer found in the U.S. military. Commissioned Officers, who are generalists in contrast to Warrant Officers who are specialists. Company Grade Officers – Army, Air Force and Marine Corps officers in the pay grades of O-1 to O-3. Executive Officer (XO) – Naval Officer who is second in command, reporting to the Commanding Officer (CO). Field Grade Officers – Army, Air Force and Marine Corps officers in pay grades O-4 to O-6. Flag Officers – In the Navy or Coast Guard, an admiral, vice admiral, or rear admiral (above the rank of Captain). Commonly applies to all general officers authorized to fly their own command flags in the military. General Officer (GO) – An officer ranking above colonel in the US Army, Air Force, or Marine Corps with a pay-grade of O-7 and above. General Officer ranks include Brigadier General (one-star), Major General (two-star), Lieutenant General (three-star), General (four-star). Five-Star ranks are generally reserved for war time use. Junior Grade Officers – Navy and Coast Guard in the pay grades of O-1 to O-3. Mid-Grade Officers – Navy and Coast Guard in the pay grades of O-4 to O-6. Non-Commissioned Officer – Someone of low rank in the army, air force, or marines who has earned the rank of officer after joining the military. Non-Commissioned Officer in Charge – Signifies an individual in the enlisted ranks of a military unit who has limited command authority over others in the unit. Officer in Charge (OIC) – A commissioned officer in charge of an organization, facility or function, responsible for a group of Officers and Sailors in the organization. Warrant Officers – Hold warrants from their service secretary and are specialists and experts in certain military technologies or capabilities. The lowest ranking warrant officers serve under a warrant, but they receive commissions from the president upon promotion to chief warrant officer 2. commissioned warrant officers are direct representatives of the president of the United States. There are no warrant officers in the Air Force. 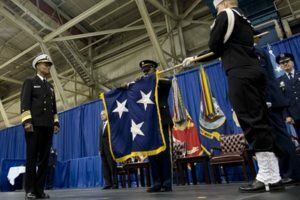 Change of Command Ceremony – A military tradition that represents a formal transfer of authority and responsibility for a unit from one commanding or flag officer to another. Promotion Ceremony – These celebrations take many forms and are intended to motivate others to excel and to perpetuate values of service before self and excellence. These ceremonies are as much about the attendees as the promotee. Retirement Ceremony – Signals the end of the office appreciation for the many years of faithful and honorable service the member has devoted to their country. Commander-in-Chief – The President of the United States who is in charge of all of the U.S. Armed Forces. Secretary of Defense – The leader and chief executive officer of the Department of Defense, the executive department of the Armed Forces of the United States of America. Chairman of the Joint Chiefs of Staff (JCS) – Advises the President of the United States, the Secretary of Defense, the Homeland Security Council and the National Security Council on military matters. The Joint Chiefs of Staff does not have operational command of U.S. military forces. A civilian head of these Departments, responsible for conducting all affairs related to the Department. The Secretaries report to the Secretary of Defense and is appointed by the President of the United States and confirmed by the Senate. Commandant of the Marine Corps (CMC) – The highest-ranking officer in the United States Marine Corps and is a member of the Joint Chiefs of Staff. The CMC reports directly to the SECNAV. contract administration; procuring contracting officer. Air Liaison Officer (ALO) – The senior tactical air control party member attached to a ground unit who functions as the primary advisor to the ground commander on air power. Air Mobility Liaison Officer (AMLO) – A rated United States Air Force mobility air forces officer selected, trained, and equipped to assess, train, advise, and assist with mobility air forces and ground force integration for air movement and sustainment. Army Knowledge Online (AKO) – Provides web-based information services to the United States Army, joint, and Department of Defense customers. Enterprise services are provided on both classified and unclassified networks, and include portal, e-mail, directory, discovery, and single sign-on functionality. All members of the Active Duty, National Guard, Reserves, Army civilian, and select contractor workforce have an account which grants access to Army web assets, tools and services worldwide. Central Control Officer (CCO) – The officer, embarked in the central control ship, designated by the amphibious task force commander for the overall coordination of the waterborne ship-to-shore movement. Colonels Management Office (COMO) – Advises, informs, and mentors for the success of Colonels, Chief Warrant Officer 5s, and Sergeants Major. We actively manage talent (assignments and education) to broaden leader experience and align individual desires with Army requirements. Combat Cargo Officer (CCO) – A Marine Corps embarkation/mobility officer permanently assigned to amphibious warfare ships or naval staffs, as an adviser to and representative of the naval commander in matters pertaining to embarkation and debarkation of troops, their supplies, and equipment. Container Control Officer (CCO) – A designated official (E6 or above or civilian equivalent) within a command, installation, or activity who is responsible for control, reporting, use, and maintenance of all Department of Defense-owned and controlled intermodal containers and equipment from time received until dispatched. Contracting Officer – A Service member or Department of Defense civilian with the legal authority to enter into, administer, modify, and/or terminate contracts. Defense Coordinating Officer (DCO) – Department of Defense single point of contact for domestic emergencies who is assigned to a joint field office to process requirements for military support, forward mission assignments through proper channels to the appropriate military organizations, and assign military liaisons, as appropriate, to activated emergency support functions. Embarkation Officer – An officer on the staff of units of the landing force who advises the commander thereof on matters pertaining to embarkation planning and loading ships. Emergency Preparedness Liaison Officer (EPLO) – A senior reserve officer who represents their Service at the appropriate joint field office conducting planning and coordination responsibilities in support of civil authorities. Flight Deck Officer (FDO) – Officer responsible for the safe movement of aircraft on or about the flight deck of an aviation-capable ship. General Officer Management Office (GOMO) Handbook – Maintains Biographical Data for use in answering media queries and in initiating releases of public information on newsworthy occasions. of Staff of the Army (CSA) to discuss promotions, assignments, retirements, and other management issues, and his assignment tenure is usually linked to the CSA’s (approximately 4 years). General Officer Management System (GOMS) – Master File includes records contain an officer’s current position, education, military assignments, military awards and decorations, and effective dates of promotion. General Officer Management Office Website – The GOMO site contains updates on the promotions of officers, officer resumes, and other general information. The Army GOMO web site has been moved to the Army Knowledge Online (AKO) Portal and is accessible only with a controlled Common Access Card (CAC). Joint Data Network Operations Officer (JDNO) – The joint task force operations directorate officer responsible to the commander for integrating data from supporting components into a common database used to generate the common tactical picture. Joint Interface Control Officer (JICO) – The senior interface control officer for multi-tactical data link networks in the joint force who is responsible for development and validation of the architecture, joint interoperability and management of the multi-tactical data link networks, and overseeing operations of a joint interface control cell. Joint Meteorological and Oceanographic Officer (JMO) – Officer designated to provide direct meteorological and oceanographic support to a joint force commander. Landing Signals Officer (LSO) – Officer responsible for the visual control of aircraft in the terminal phase of the approach immediately prior to landing. National Guard Bureau, General Officer Management Office (NGB-GO) – Senior Leader Management Office of the National Guard Bureau located in Arlington, VA. Officer in Tactical Command (OTC) – In maritime usage, the senior officer present eligible to assume command, or the officer to whom the senior officer has delegated tactical command. Officer of the Deck (OOD) – 1. When underway, the officer designated by the commanding officer to be in charge of the ship, including its safe and proper operation. 2. When in port or at anchor, the officer of the deck is designated by the command duty officer, has similar responsibilities, and may be enlisted. Primary Control Officer (PCO) – In amphibious operations, the officer embarked in a primary control ship assigned to control the movement of landing craft, amphibious vehicles, and landing ships to and from a colored beach. Principle Officer – The officer in charge of a diplomatic mission, consular office, or other foreign service post, such as a United States liaison office. Procuring Contracting Officer – A contracting officer who initiates and signs the contract. given country or group of adjacent countries. Senior Leader Development Office (SLDO) – The Army dedicates resources to the administrative management of senior officers. Spearheading the effort is the Senior Leader Development Office (SLD), comprised of the Colonels Management Office (COMO) and the General Officer Management Office (GOMO). SLDO monitors the bench of Soldiers filling the most senior positions in the Army Reserve and in support of Combatant Commands. Senior Meteorological and Oceanographic Officer (SMO) – Meteorological and oceanographic officer responsible for assisting the combatant commander and staff in developing and executing operational meteorological and oceanographic service concepts in support of a designated joint force. Tactical Air Officer (TAO) – The officer under the amphibious task force commander who, until control is passed ashore, coordinates planning of all phases of air participation of the amphibious operation and air operations of supporting forces en route to and in the objective area. subordinate through which command is exercised. Chief of Staff (COM) – The senior or principal member or head of a staff who acts as the controlling member of a staff for purposes of the coordination of its work or to exercise command in another’s name. Command Flag – The command flag is the focal point of a unit. Each element in the design typically has a unique meaning. They serve as a symbol of pride for units. Flag Officer Flag – The flying of a flag at the masthead to designate the vessel of a fleet commander. A Flag Officer’s flag only flies in the vessel in which he is physically present. It is hoisted and kept flying until they turn over their command to their successor. General Officer Adornement’s – General Officer’s receive a pistol (the Colt caliber 380 pocket model), flag, belt buckle, holster, magazine, cleaning rod, brush and other accessories. The ceremonial GFO belt and pistol has a long history for officers dating from World War II when their belts were used to carry sabers. The thick black leather belt has an 18-karat gold-plated buckle and imprint of an eagle was first produced in 1944. The pistols are special in that they are procured especially for general officers, with serial numbers prefixed with the letters “GO”. Most general officers purchase their pistols when they retire. Senior Executive Service Flag – The SES flag was designed in 1988. The design includes the SES insignia (a keystone). Additionally, there are thirteen gold stars surrounding the SES symbol signify the original thirteen colonies. Senior Executive Service Ensignia (or Emblem) – The SES insignia or emblem at the center of the design represents a keystone – the center stone that holds all the stones of an arch in place. This represents the critical role of the SES as a central coordinating point between Government’s political leadership which sets the political agenda and the line workers who implement it.